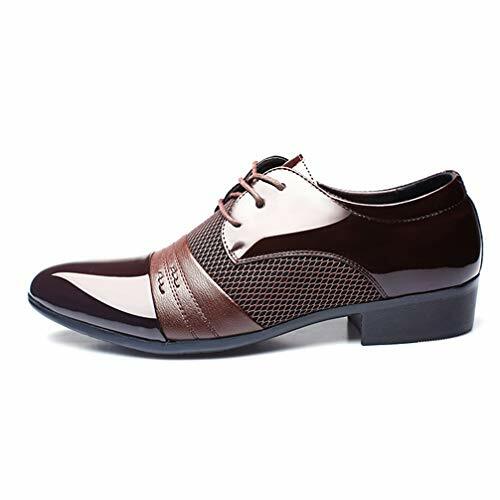 Best gifts for yourself, your lover or friend.Fit on: tuxedo and also a slim fit chinos or khakis will be great, or a casual jean.Highly recommend for the price, and of course durable because time will tell you.Breathable upper, Flexible and Comfort oxfords.Our shoes may have some smell, but this is a normal situation for new shoes, because they are too lonely in the box, it is lonely taste. You can put it out a few hours, or with activated carbon or grapefruit skin, it also can quickly remove the smell if you put some activated carbon or grapefruit skin in.Please compare with your foot length before selecting the size. "Add to cart" now, just wait for 7-15 days, you can have it! ANTI-SLIP AND WEARPROOF:Rubble sole,anti-slip and wearproof. EASY AND CONVENIENT:Easy wear on and off,Lightweight,flexible,slip-on style,comfortable and perfect for all occassions. BREATHABLE AND DURABLE:Comfort foot bed cushions your feet from heel to toe with additional support for your arch. SIMPLE AND STYLISH:Perfecf for daily walking,driving,go to work,office,business trip. PERFECT MODELING:Go out with a pair of Oxford shoes amd brings you a return rate and perfect style. If you have any questions about this product by Phil Betty, contact us by completing and submitting the form below. If you are looking for a specif part number, please include it with your message.